Music and comedy have always made for strange, if comfortable, bedfellows. During Bob Dylan's mid-1960s heyday, his concerts would inspire nearly as much laughter as applause, and more recently, comedians such as Jack Black and Adam Sandler have reached for guitars for kicks and a lasting chuckle. Laughter's evanescence and music's permanence interact awkwardly, like clashing flavors of ice cream. How many listens of a funny song can a joke sustain before it stops being funny? Conversely, how talented can comics be as musicians? For Jemaine Clement and Bret McKenzie, the New Zealand duo that make up Flight of the Conchords, now the stars of an HBO series of the same name, the questions are rendered partially moot. Being both musicians and comics, Clement and McKenzie have intertwined their two loves into a seamless whole. Is it comedy? Is it music? "Flight of the Conchords" is comedy for music nerds, sweeping a universe of visual and aural associations under its wing, and poking fun at the cliches of popular music in the process. The series recounts the absurdist adventures of Jemaine and Bret, New Zealand musicians who relocate to New York City in the hope of striking it big. Stuck with a hapless manager named Murray and a lone fan, the duo struggle to make a living, and find love, while in search of their moment in the spotlight. "Flight of the Conchords" mines comic gold from the gap between their lives and their music, with the straitened circumstances of the former contrasting starkly with the lush pseudo-grandiosity of the latter. 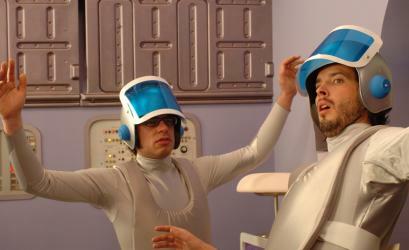 Many of the Conchords' musical interludes enjoy a good laugh at the expense of pop cliche, with sound, decor, costumes, and visual technique echoing specific genre conventions. "We all have quite broad musical tastes," says series co-creator James Bobin. "The history of music video is very interesting, and I think this is quite a good way of reflecting their musical diversity." Flight of the Conchords (who have a new EP due out from Sub Pop next month), nominally a folk duo, utilize a wider palette of sound for their musical numbers, embracing hip-hop, boy-band pop, and syrupy romantic ballads. In each case, Clement and McKenzie's non-sequitur lyrics and asides provide the bulk of the comedy, with the remainder filled in by the amusing mise-en-scène. In the debut episode of the series, the heartfelt breakup ballad "I'm Not Cryin' " features McKenzie (an elfin type whose scraggly beard is a comic visual effect in its own right) standing beside a rain-slicked window. "These aren't tears of sadness because you're leaving me, I've just been cutting onions. I'm making a lasagna," McKenzie whispers, "for one." The visual cliches of the lovelorn (rain-soaked streets, abandoned lots) are invested with comic flair via their association with the Conchords' deliriously odd take on the lyrical conventions of the form. The distance between the feeling conveyed by the music and the ludicrousness of the band's lyrics provides the impetus for Flight of the Conchords' anarchic humor. "Think About It" parodies current-events-conscious pop balladry a la George Michael circa 1990, complete with the keening chorus "What is wrong with the world today?," but a close listen to the words conveys another message entirely. The song begins appropriately enough, with McKenzie pacing nervously down a New York street, worrying about "children on the street using guns and knives, taking drugs and each other's lives." Clement takes the baton, poking his head out an apartment window and pondering the fate of "people on the street getting diseases from monkeys." The song goes on to take in the plight of framed cops and the surprisingly high cost of child-labor-produced sneakers. The jumbled laundry list of topics, complete with scientific confusion about monkeys and diseases, is a pitch-perfect re-creation of socially conscious musical sloganeering from the era of AIDS panic and the first Gulf War. The Conchords attack other targets with similar accuracy. "She's So Hot-Boom" makes merry with the conventions of early MTV, with cheesy Atari graphics as backdrop to Bret's ode to a woman "so hot she's making me sexist." And "Song for Sally" mocks Elton John-style piano balladry, both sonically and visually, its overblown emotion matched by garish lighting and repeated use of the lap dissolve. "I like the idea of people going through the shows and trying to work it out -- where these things are from and who we're referencing," says Bobin. "I hope that's one of the levels on which the show works." Flight of the Conchords' songs are funny in part because Clement and McKenzie are utterly sincere, comporting themselves with dignity while bellowing the lyrics of their absurdist compositions. Clement favors a baritone boom for emotional moments, and McKenzie drops his voice to a hushed whisper, like an auxiliary member of 'N Sync. True band geeks, they let the music dictate their approach and the specifics of their humor. The humor in the episode "Bowie" is predicated on familiarity with David Bowie's chameleonic personality, with Ziggy Stardust and "Let's Dance"-era versions of the legendary singer showing up in Bret's dreams to offer (mediocre) career advice, like suggesting wearing an eye patch. Bobin is unconcerned about going over viewers' heads. "I'd rather not ever make anything overly simple just because I'm scared people won't get it," he says. For the hip-hop battle song "Hiphopopotamus vs. Rhymenoceros," the duo is filmed with a distorting fish-eye lens -- a staple of hip-hop videomaking. The Conchords take turns rushing the camera like amped-up MC's anxious for their moment in the sun. Clement gets a bit carried away, yanking the mike away from his partner with the audacious boast "I'm the hiphopopotamus, my lyrics are bottomless" before literally bottoming out, dazedly staring into the camera for the next few beats, unable to get another word out. Jemaine and Bret's already-tenuous claims for hip-hop credibility are only further undermined by their attire: Clement is wearing a tan blazer and slacks, like a college professor on summer holiday, and McKenzie is inexplicably clad in a bright-yellow reflector vest traditionally seen on suburban crossing guards. Impoverished folksters they may be in their "real" life, but in the fantasy world of their musical interludes, Flight of the Conchords are worldwide superstars, their every grunt and fumble the subject of loving attention. Their primary purpose may be to amuse, but the pair are too in love with the music -- in self-aware fashion, with a wink and smile, knowing of its foibles and conventions, but deeply and truly as well -- to be merely funny.